Express your love with the vintage inspired glamour and elegance of this stunning diamond bridal set from Perfect Fit. Set in 9ct yellow gold, this set totals 1/5 carat of diamond, and features a marquis shaped diamond cluster ring complete with diamond halo for added sparkle, and is finished with a perfectly matched diamond wedding ring for style and fit. 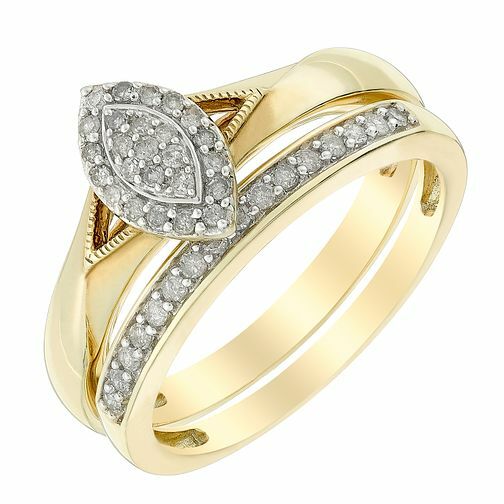 Perfect Fit 9ct Yellow Gold Marquis Diamond Bridal Set is rated 4.5 out of 5 by 6. Rated 5 out of 5 by Anonymous from Absolutely beautiful! This bridal set is absolutely beautiful! I've been married for 3 years but asked my VERY unromantic husband for an engagement ring for nearly 8 years (and a proper wedding ring that I hadn't bought for myself!). He's finally surprised me and chosen this himself, and I have to say it's incredibly beautiful. I'm so impressed with the quality and the thickness/ weight of the gold, the diamonds are very neat with a great deal of sparkle overall a stunning bridal set! Well worth twice the price paid and then some! To say I'm delighted is an understatement, I'm absolutely over the moon. If you are reading this, I definitely recommend this perfect fit bridal set. And the gift box set it arrives in is the icing on the cake. Rated 4 out of 5 by Anonymous from Great bridal set,robust and beautiful This is actually the ring i'm wearing now. Love it.